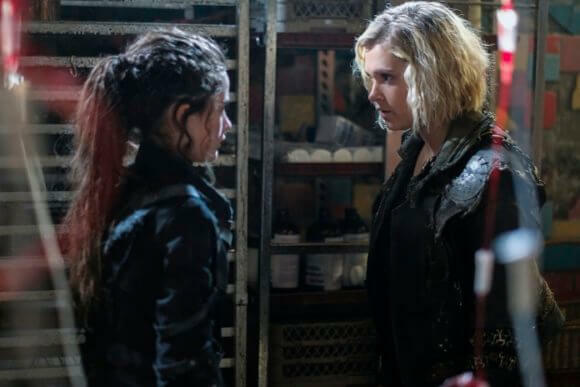 After what feels like an eternity, The 100 is finally returning to The CW’s primetime lineup on April 30, 2019. The sixth season of the gritty sci-fi series will air on Tuesdays at 9pm ET/PT, with the new season finding the remaining survivors attempting to establish a new base on a new planet. Series star Eliza Taylor (“Clarke Griffin”) discussed the much-anticipated sixth season during roundtable interviews while at the New York Comic Con. Taylor confirmed fans of the drama can expect the action to pick up just where season five left off. She also discussed saying goodbye to Christopher Larkin (“Monty Green”) and Chelsea Reist (“Harper McIntyre”), and how the show reinvents itself each season. Do you feel like every season is kind of a reboot? Is that reinvigorating for you? Every season has been like a new chapter, but with season six it’s like a new book. Is there a different feel to it than before? With the new world that you’re going to, will the series be introducing new lifeforms? Or will it steer clear of that? Will the antagonist for this season come from the new planet or will it come from within? Will Clarke and Bellamy continue into this new season as sort of co-leaders again? Will that be how it works going forward? Last season we saw Clarke’s motherly side emerge. This season what can we anticipate is driving her? Were you totally shocked when you saw the direction the season was heading? How far into last season did you find out that Harper and Monty were leaving? It’s like losing a member of your family. Do we pick up right where we left off? Will we see the other characters learn about their deaths? You’re already acting as a mother to Madi. Will Clarke take on the same sort of role with Jordan? Is there anything you can say about relationships season six? Do you get to pitch any ideas of who you would like to see Clarke interact with a little more in season six? Have they written in anything you pitched that way over the past seasons? Is there a storyline you really want to see Clarke go through? How would you sum up the tone of this new season compared to the previous seasons?